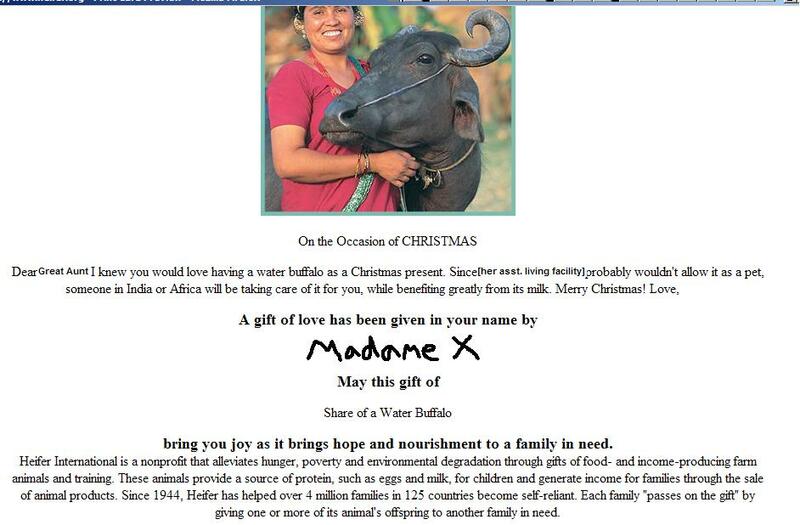 I gave my great-aunt a water buffalo. I have a great-aunt in her mid-90s. She is a cool lady and one of these days I'll write more about her, as she has been kind of a role model for me-- she never married, had a good career, traveled widely, and stays active with lots of activities at the assisted-living place that she moved into a couple of years ago when she finally couldn't live on her own any more. I think a water buffalo makes a great gift. I may have to use my ad proceeds from this site to purchase another one. Btw, I have always wondered by there are no water buffaloes in the warmer regions of US. At least the milk should be here; it tastes much better than cow milk. You deserve the 'title of the month' award. LOL I was like, she did WHAT? Then come over here to find out what you did was totally awesome! SingleMa-- Heifer does send animals to people in the US as well as other countries around the world. But the water buffaloes probably all go overseas! I'm one of those people too -- have everything I need, well traveled, etc... and would love a water buffalo! That's a seriously great gift! Philip Greenspun and Robert Thompson give a real Water Buffalo to a real Family! This video brought me to tears: 4 Generations Movie The most emotional part is when the grandmother figures out that she has been picked at random to receive this gift and says it's too much. She turns and wipes the tears from her face because it would be disrespectful for her to cry in front of guests. Powerful movie.